Snow happens, as it did just a few days ago, and since snow doesn’t stop life from happening, I warmed up teeny car and went for a drive. You know that feeling when you’re almost where you need to go, like you can see it, right there in front of you, but the snow had other plans? I do now, haha! So today, I decided I’d learn more about the truck world of it all. 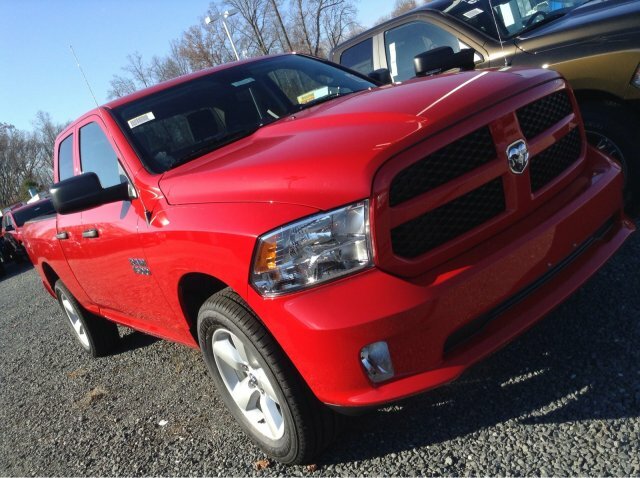 You know, put on my manliest face and head on over to Prince Frederick Dodge to see how it feels to sit high off the ground in a deep cherry red Ram 1500. This beast of a truck is tall and mean. Like the good mean, if you know what I mean… It just exudes strength, and power, and you feel powerful when you get behind the heated (yes, heated) steering wheel. Gone are the days of frozen fingers as you drive. The peddles are power – they actually can move up closer to you. pretty cool! I can still sit up tall, without the steering wheel in my face. Oh, and the seats, not only are they heated, but they are vented. Hot leather seats burning your legs in the summer, not a chance! Even if it does sound good in these frigid temps. works for families, or people who like to make sure just in case the world ends, they have everything they need right there (you may call it hoarder, I call it prepared, haha). In fact, the 2015 Ram 1500 has been named one of the 15 best family cars by Kelly Blue Book.